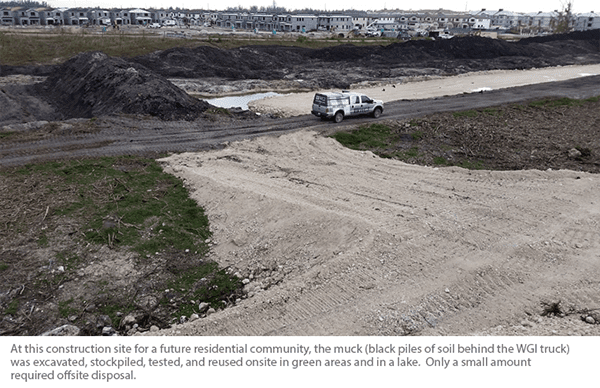 The scarcity of Florida’s buildable land has developers turning to parcels they previously passed over because they contained thick layers of muck. Muck (wet, sticky soil made from decaying plant material) presents several challenges for developers, including, (1) it normally indicates a wetland is present that needs permitting and mitigation, (2) it is geotechnically unsuitable for building upon, and (3) it can contain arsenic in concentrations above residential standards. In this article, we will specifically address the arsenic problem. Arsenic is typically present in muck for a combination of reasons; some natural and some anthropogenic (human-caused). A primary source of anthropogenic arsenic is the use of herbicides like monosodium methyl arsenate (MSMA). An important first step is to determine what portion is naturally occurring and what portion is anthropogenic. Although any arsenic above cleanup target levels needs to be managed to protect human health, if it is naturally occurring, arsenic generally can be managed safely onsite without the need for deed restrictions (which can lower property values). A well-crafted soil sampling plan and some statistics can usually distinguish naturally occurring arsenic from anthropogenic arsenic. During arsenic cleanup, another crucial step is matching the cleanup strategy with the project’s desired end result. A single development project may have multiple land uses: single-family residential, commercial, open recreational space, assisted-living facility, conservation easement, etc. Each of these land uses may have a different cleanup target level for arsenic. The most cost-effective remedial strategy will typically address each future land use separately. Before WGI proposes a remedial plan for arsenic, we meet with the developer (including the geotechnical engineer and the general contractor) to understand what earthwork needs to occur regardless of any arsenic remediation. What lakes need to be dug? How much soil needs to be imported or exported for grading and flood control? What earthwork needs to occur to create geotechnically stable subsoils? Then we develop a cost-effective remedial plan that incorporates the earthwork that needs to get done anyway for other site development purposes. If active arsenic remediation is needed, WGI has a range of effective tools. In some cases, removal and offsite disposal of some “hot spots” are the most economical, followed by soil blending of the remaining muck with soil that has lower concentrations. One of our most common solutions is to over-excavate a lake (especially if the development needs a source of clean fill material) and place the muck in the bottom of the lake. A key consideration here, however, is to test the soil using the Synthetic Precipitation Leaching Procedure to ensure the arsenic will not leach out of the muck and contaminate the groundwater. Also, the environmental regulatory agencies require a comprehensive water quality assessment, including pre-construction (baseline) monitoring wells, to compare to post-construction conditions. Sometimes the best “tool in the toolbox” is to leave some of the muck right where it is, especially if onsite wetland preservation is needed. Our extensive experience shows the most cost-effective solution uses multiple tools from that toolbox. John Abbott has 22 years of experience in environmental planning and contamination remediation. He has worked on some of the largest contamination sites in the United States. A brief history of Pine Flatwoods in South Florida In early August, the WGI Unmanned Aircraft System (UAS) team was deployed to the Jonathan’s Landing Old Trail golf course property in Jupiter, FL..